Zoom will feature 17 exhibitions with 2 nights of openings. Assimilation is an exhibition that focuses on the idea of digital craft. This exhibitions showcases artwork and designed objects that demonstrate an integrated use of digital technique with that of traditional craft process; objects that fully assimilate the digital with traditional forms of making. Typeset is an exhibition exploring the connections between the fields of jewelry and literature. Typeset builds on our previous collaborative exhibition on this theme, Wordsmith, by setting literary-minded art jewelry objects into the University of Wisconsin Milwaukee Special Collections at the Golda Meir Library. Work will be selected from jewelers who embrace text, story and history in their work, and will be shown alongside selected literary objects drawn from the incredible catalogue of the Special Collections Library. By illuminating contexts, connections and modes of making, we aim to broaden the conversation on narrative and object making. As artists, we are constantly in a push and pull between conceiving and actualizing. [In]Tangible exhibits artworks that conceptually explore notions of making the intangible, tangible by current or recently graduated Masters of Arts and Master of Fine Arts students. In Marble, Mirrors, Pictures, and Darkness, Anya Kivarkis and Mike Bray examine representations of jewelry, luxury and glamour as depicted in cinema. In an effort to understand and deconstruct the immersive nature of the medium, they are investigating, sourcing, and attempting to reconstruct objects and settings from scenes within the narrative. Replicating only what is observable in the image of objects mediated through the screen, Kivarkis and Bray build the heightened lighting of film, focus, reflection, and the obstruction and gesture of a wearer’s body into these reconsidered objects, photos, and moving images. The Union Art Gallery at the University of Wisconsin - Milwaukee will host an exhibition showcasing the work of a diverse group of art educators from throughout Wisconsin. Working in a wide range of mediums including ceramics, fibers, wood, glass, and metal, these artists inspire creativity in their students while maintaining innovative art practices of their own. Crush III is an international invitational showing of contemporary metalwork that seeks to showcase the work of emerging through well-established makers in the field. Divided by state lines, oceans and ways of working, what brings this diverse group of makers together is a simple invitation and the knowledge that someone thinks their work is completely crush-worthy. This is the third installment of this exhibition theme. Crush and Crush II debuted at the University of Indiana. The driving force behind the title of the exhibition is to push each participant to think outside the box when considering their approach to employing traditional enameling processes and materials and to rethink the boundaries of what can be done. This group of work began with an immersive workshop experience in diverse enameling techniques held at Pocosin Arts and attended by UW-Milwaukee, Indiana University, Bowling Green State University, and East Carolina University. Overall, the collaboration and exhibition is about taking risks with one’s work - challenging and learning from each other - tapping into uncharted waters and jumping in with gusto - in addition to welcoming the failures as well as the successes. Trained as a metalsmith, Kim Cridler creates works that utilize the history, making, and meaning of objects of utility and ornamentation. At Lynden, she will be showing large arboreal works in steel, bronze and beeswax, as well as drawings and some smaller works. The way Cridler uses drawing as a practice of "noticing" directly informs her recent work, in which the steel wire or rod becomes a line of inquiry into form, content, and the potential of narrative. REPEAT features work that utilizes repetition both as a technical and conceptual approach. Components, facsimiles, and patterns are present in varying ways within this exhibition and are explored in unique ways. Artists are paired and displayed together to enhance the conversation between disparate ideas and aesthetics while drawing upon the inherent commonalities. EMBODIED is an exhibition exploring the collision of jewelry fashion and design in motion by connecting the body and re-defining the impossibility of wearing. This exhibition invokes the poetics of the history and traditions of jewelry while simultaneously subverting notions of material, scale and wearability. EMBODIED will feature a live exhibition of inventive work that relies on the body to convey meaning. This will be a one-hour special performance on Thursday, May 26th from 7:30 – 8:30pm followed by an installation for the duration of the ZOOM Symposium. Arrowmont School of Arts and Craft hosted the summer 2015 Advance/Retreat organized by Ana Lopez. Fifteen artists gathered for studio time taking a break from their daily demands. Participants brought finished and unfinished work to discuss technique, form and experiment with new ideas. This exhibition features the work created at this retreat. Artists include Haley Bates, Jeff Bowie, Motoko Furuhashi, Jill Gower, Yevgeniya Kaganovich, Anya Kivarkis, Ana Lopez, Natalie Macellaio, Becky McDonah, Jennie Milner, Mary Pearse, Phil Renato, Lauren Selden, Stephanie Voegele and Cappy Counard. An exhibition of art jewelry created from broken sentimental objects given by Facebook friends from all over the world. The form and material of the jewelry is determined by the personal stories attached to the objects shared by each of the participants. 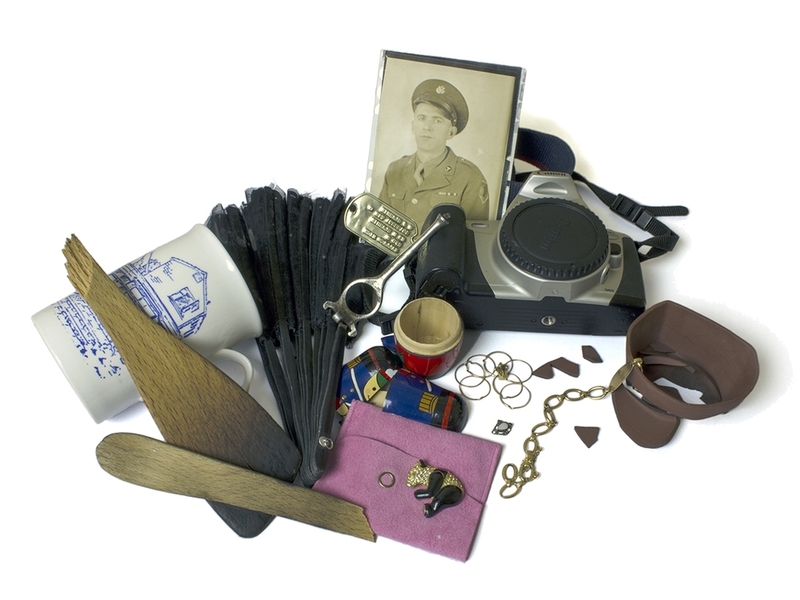 The objects are given a new life, containing old and new memories. Verrastro's design process will be posted to the Memorial & Reincarnation Facebook page regularly and updates will be shared online. The transformed object as jewelry becomes a method of connecting to a larger public audience and established art jewelry enthusiasts. The Smitten Forum is an opportunity for makers from the metalsmithing and jewelry field to come together in a creative environment away from the normal routine and obligations of everyday life. The 2016 forum was held at Pocosin Arts. Invitees ranged from emerging to well-established makers, educators and professional jewelers. A variety of techniques and materials were represented, including traditional silversmithing, fiber construction, enameling, computer aided design, wood, found object assemblage, cement casting, and etching. Attendees used the week to focus on their work as well as welcome insight from others in a social studio setting. This exhibition will showcase work made during or after the artists' time together. In Transit showcases jewelry and metalwork that exemplify a spirit of transition. To transform is defined as the act of changing from one state to another. Transition is a vehicle for change in the way jewelry is a vehicle for personal expression. This unique exhibition will be on display inside the Blue Onion Bus studio/gallery. The portrait is an artistic representation of a subject, highlighting unique aspects of personality, mood and attitude. Jewelry, as a format, has served as a symbol of personality, power and status. Reflect is a contemporary reaction of art jewelers to historical female portraits from the permanent collections of the Rehoboth Art League, in Rehoboth Beach, Delaware, and the Biggs Museum of American Art, in Dover, Delaware. Eleven international jewelers have been selected to react to 11 portraits from these two prominent collections. The portraits and jewelry seen together will create juxtaposition between new and old, the image and the object, representation and reflection. 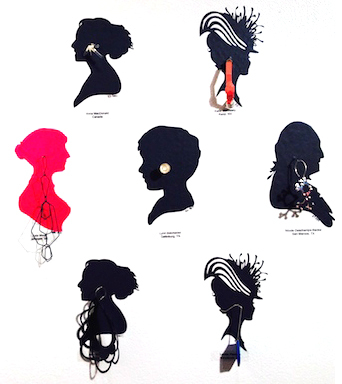 The objective of this exhibition is to show rich and diverse examples of earrings made by artists. Although each jeweler’s artistic intent may be specific, the show will consist of a broad range of thoughtful work. The exhibition creates access for the public to engage art jewelry for the first time or a way to add to their collection. Seven artists were asked about what motivates them and how they work through ideas. This exhibition is the result of visits to the artist’s studios and in-depth conversations with them regarding their interests and their process for making work.